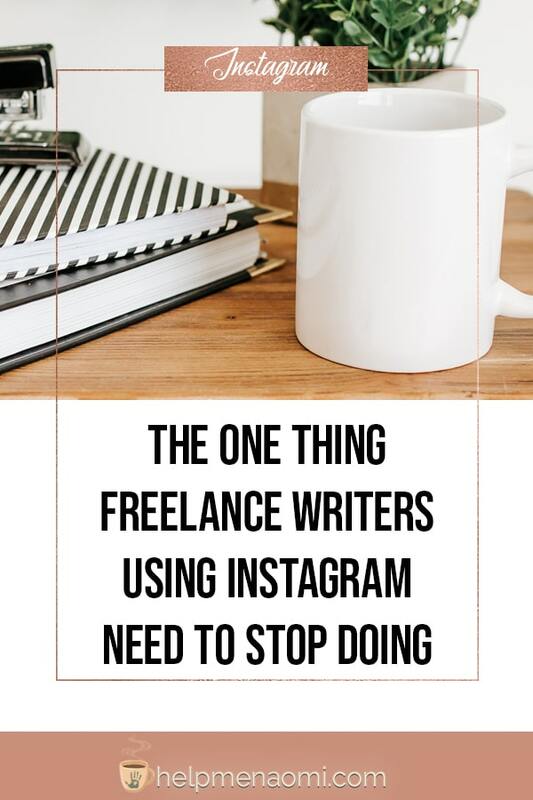 Chances are you’ve already heard all the buzz about freelance writers using Instagram. 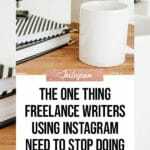 And as a freelance writer, why wouldn’t you be on Instagram? Instagram boasts over a billion monthly active users — a huge jump from the 90 million they had in 2013!! While Instagram might have once been thought of as that “teen app” its adult usage has grown by more than 400%. Engagement rates on Instagram are much higher than on Facebook or Twitter. Nearly 80% of all Instagram users follow at least one brand. As you can see, Instagram is a powerful marketing platform. And part of what makes it powerful is the ability to connect with our audience in a more personable way. Now I know, you can connect with your audience on other platforms — and that is true. But people go to those other platforms for different reasons. A lot of the time, people connect with brands because they want to know when they can get a discount. In fact, 36.9% of users on Facebook and 43.5% of users on Twitter follow brands specifically so they can be in the loop for special offers. And up to 70% say they’ve used social media to win contests or giveaways. Instagram is different. It’s not necessarily a place to sell you writing services. Why? Because people don’t go to Instagram looking to hire their next blog writer, ghostwriter, or copywriter. So if you’re only there to sell your services, they’re going to ignore you and move on. Instagram users sign up to check out the artistic expression of lifestyle – they want to know how you live! They want to see the world around you and see how you fit into it. They want to see the tools and products you’re using, and they want to see social proof of how these tools are bringing you success. And some of them just want to see some black coffee steaming in an artsy cup next to a typewriter. Because, let’s face it, when people think of writers, they think coffee, steam, glasses, pens, quills, laptops, and typewriters. 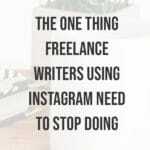 Freelance Writers using Instagram should aim to get their writing noticed, not their services. Instagram might be about the visuals, but that doesn’t mean the writing doesn’t matter. In fact, the first 125 characters within those captions might be the most important writing you do. Other than your photos, the first 125 characters of your caption is all you have to catch someone’s attention and draw them in so they can read the rest of your post. Frontload the beginning of your caption with the hook and call to action. You have 125 characters before the caption will be truncated with a link to “see more.” Use them wisely. Don’t crowd your writing with hashtags and mentions that make them hard to read. In fact, keep your hashtags and mentions near the end of your captions. Keep it fun and lighthearted. The copy that you use on LinkedIn is not going to work with Instagram’s laid-back vibe. Take your brand voice and make sure it melds with Instagram’s more relaxed tone. Make sure it’s relevant to the image you’re posting. It should provide context for your image. It should inspire your followers. It should highlight your brand personality. I stumbled upon this post by accident, but it was extremely well done! And you’re absolutely right with your point of the post. Thank you so much for commenting. I love stumbling into good content, so I really appreciate that you found this valuable.